Pure Evoke-1S Marshall review | What Hi-Fi? If some of Pure's DAB radios such as the Evoke Mio by Orla Kiely are aimed at the ladies, then it's fair to say there will probably be more men than women drooling at the sight of a DAB radio that looks like a guitar amp. 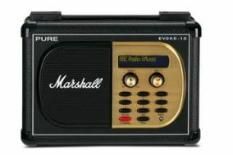 Yes, Pure has done another Marshall-inspired radio, this time based on the Evoke-1S. A fine radio in its own right, this special edition simply adds a new skin. So you'll still find all the features that come with the original Evoke-1S: DAB and FM tuners, an auxiliary input, a line output, a headphone connection and the opportunity to add a second speaker for stereo sound (the Marshall version of the external speaker, £35, arguably looks even cooler than the radio). It's mains or battery powered – provided you shell out around £30 for Pure's ChargePAK – and most crucially, it sounds as good as its looks. Listening to BBC Five Live it's clear and detailed, providing smooth, solid vocals that are given plenty of room to breathe. Switch to Kerrang! for something a little more challenging – and more fitting for this radio – and you can enjoy plenty of detail, drive and rhythm, from a solidly balanced sound. For those about to rock… this may well be your radio of choice.